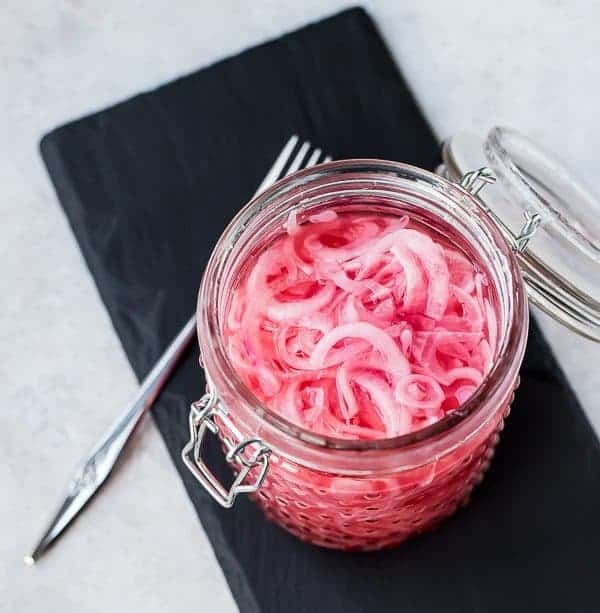 Learning how to make pickled red onions is SO easy – it only takes five minutes and you probably have all the ingredients! You’ll love having a jar of these in your fridge for tacos, avocado toast, and more! If you follow me on Instagram, you probably already know from my stories that I’m obsessed with these. OBSESSED. As in three meals a day obsessed. PS: If you don’t follow me on Instagram, consider hopping over and checking it out! You’ll see some behind-the-scenes stuff on my stories! The first time I made pickled red onions was for my daughter’s birthday party right after we moved into our new house (seriously, two weeks after). We did a taco bar with all the fixings because I seriously have no boundaries. I made corn casserole, homemade refried beans, cilantro lime rice, from-scratch margaritas, and more. One of the things I decided to make on a whim were these onions. Pickled onions are fabulous with Mexican food! I was so surprised to see them disappear SO quickly! Faster than the cheese, you guys! I can’t say I blame people, I love these pickled red onions on almost any Mexican dish and tacos are no exception. Now, when you open my fridge, you’ll often see a jar of these. 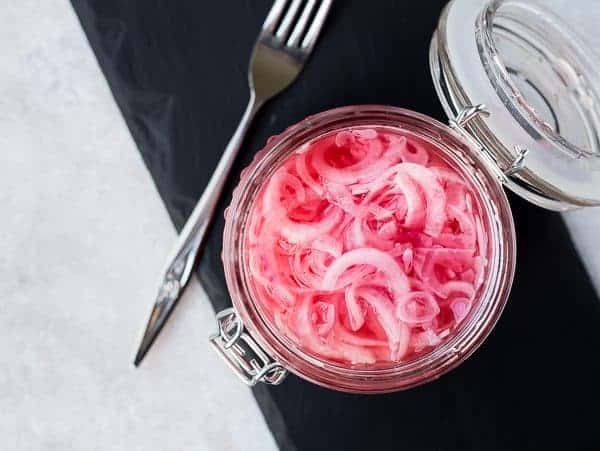 Once you learn how to make pickled red onions, you won’t stop making them either. They’re on my agenda to make today, actually — they’re so easy! One of my favorite ways to eat them is on top of avocado toast. It really livens the avocado toast up and the tangy pickled red onions are the perfect contrast to the rich, creamy avocado. I also love them on tacos, of course, as well as on grilled chicken, or just about anything else I can think of. Slice the red onions as thin as you can! I use a mandoline for this (this is the mandoline I have). Not only does it get them super thin, it also gets the job done insanely quickly. Fast is my friend. Stuff all the red onions in the jar of your choice. A bowl will work too but I like a jar for storing them in the fridge. In a measuring cup, stir apple cider vinegar, salt, sugar, and warm water to dissolve the sugar and salt and dilute things a bit. Pour the pickling mixture over your sliced onions and let them set for an hour. After an hour, I cover them and stick them in the fridge. They’ll keep in the fridge for a couple weeks! My preference is always apple cider vinegar. I typically have it on hand and I like the subtle sweetness it adds. You could also use a white wine vinegar or another light tasting vinegar. I wouldn’t recommend balsamic for these. If you’re in a pinch, plain distilled vinegar will work. 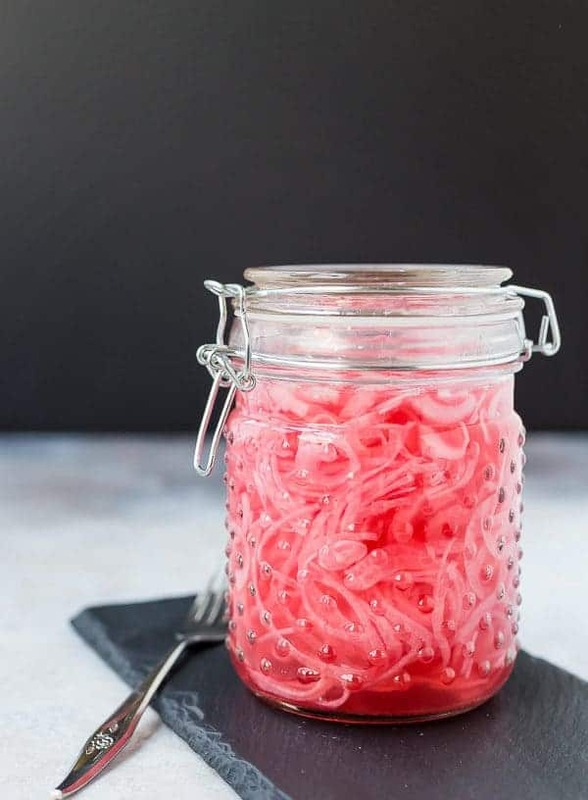 FAQ: Can you make pickled red onions without a mandoline? Absolutely! Slice them as thin as you can to get them to pickle quickly but if you don’t have a mandoline or want a slightly thicker slice, a good sharp knife and a steady hand will work just fine! PS: I got my jar out of Target’s dollar bin (I think) but these would work too. Slice the red onions as thin as you can. I use a mandoline. Stuff all the red onions in the jar of your choice. A bowl will work too. In a measuring cup, combine apple cider vinegar, salt, sugar, and warm water. Stir to dissolve the sugar and salt. Pour this pickling mixture over your sliced onions and let them set for an hour. After an hour, cover and store in the fridge for up to three weeks. Verdict: Hey, did I mention I’m obsessed? Husband’s take: Ben steers clear of raw onions so he hasn’t tried these, despite my urgings and ravings. Changes I would make: Nada. Can you explain alittle more about step 3. “After an hour cover them.” What do you mean by cover them? Do you keep them in the jar? Sorry, yes, just put the cover on the jar or container you’re storing them in. I leave it uncovered for the first hour to let the water cool off. Okay…this might be a dumb question, but coarse kosher salt or table salt? No such thing as a dumb question! Either will work in this recipe. :) Coarse kosher salt is what I typically use. I just made this today! I wanted some pickled red onion for my copycat Panera Bread Spinach Salad that I love so much! When I started to create my own recipe, I quickly found out pickles red onions is not something I could just buy from my grocery store! I was pretty bummed out. So decided to search for a recipe and after looking at several recipes, I decided th make this one and boy am I happy I did! !I followed the directions exactly, although I think my red onion was bigger than normal and produced 3 cups of thin sliced onions. I bought a large size mason jar at my grocery store and set out making the onions. It’s been sitting in the fridge for about 3 hours now and I just had to sneak a taste…let me just say the flavor is right in par! It’s lightly salty, lightly sweet and just enough vinegar. It’s a perfect balance and I can’t wait to try it on my salad for lunch! I can only imagine how much more flavorful they will be in the next couple of days! Thank you so much for this recipe, it was SOOOOO easy and the flavor is outstanding. Oh I’m so glad to hear that this recipe came to your rescue and that you liked it! Thanks for taking the time to come back and leave a comment! 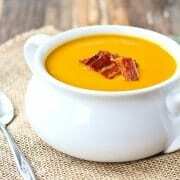 Can you canned them without ruining them with the excess heat? I haven’t canned these, so I’m not sure. Let me know if you try it! Rachel, bravo! What a great idea! Love this. I’m sure this is incredibly delicious! Thank you so much! I just made a jar of these this week, I can’t get enough of them! Question, can you eat after an hour or in two to three weeks. These were so quick and yummy.My husband has been adding them to everything. So glad you liked them, Carly! Thanks for taking the time to come back and leave a comment! Easy to make. Very tasty. Nice on a salad. So glad you like these picked red onions, David! Thanks for taking the time to leave a comment! Can this same pickling brine be used to pickle other things, like purple cabbage? I made them tonight and can’t wait to try them. I am going to make fish tacos with it and Cole slaw. I was out of Cider Vinegar which I would have preferred, but I used my white wine vinegar. I will let you know how the come out. So happy and love your website. They’re going to be SO good with fish tacos! Thank you for the kind words and for taking the time to leave a comment! I have never pickled red onions (though I think they’re one of my favorite foods), however I have marinated red onions with balsamic vinegar and it’s one of the best things I’ve ever eaten. 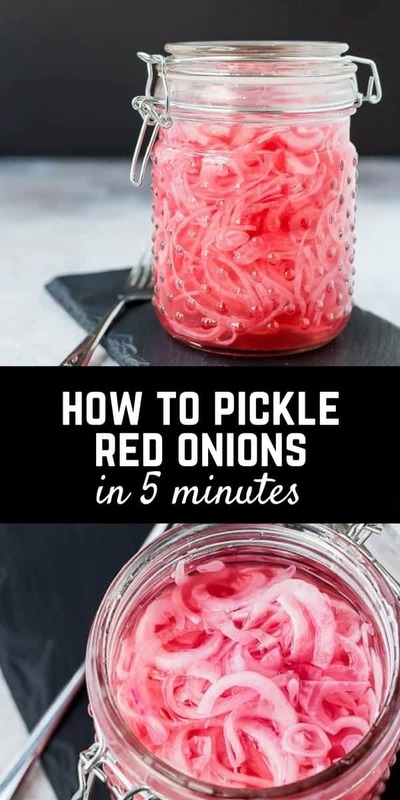 May not necessarily work for pickling, but always worth a try as red onions are just so delicious I imagine it would be difficult to mess them up:) also, may help with cutting some sugar from recipe as balsamic already has a lot of sugar. Good tip, thanks Amanda! I’ll have to try these with balsamic. I needed a pickled red onion recipe and this was the 1st one I found so I went with it. So quick, simple and delicious – this one is a keeper! So glad you like this recipe, Mike! Thank you for taking the time to leave a comment! Made this but sliced up a super hot pepper and some garlic in it. DELICIOUS!!!! Would stevia be ok to sub for sugar? I haven’t tested it that way, but it would probably work. I think you’ll want to decrease the amount though, stevia is pretty powerful. Red wine vinegar works well too. Love this recipe. It is super simple and the results a re fantastic. The tangyness of the onions go great on slow smoked pulled pork or chicken. I’m so happy to hear that! We love them on pulled pork too. Thanks for taking the time to come back and leave a comment! An hour is sixty minutes, not five. Don’t be a jerk… it’s obvious to everyone else in the world that she meant five minutes to MAKE them… most pickled things take way longer than an hour until they’re ready to eat. If it really bothers you that much to wait, maybe you should just buy them instead. P. NYM, how about we treat eachother kindly and with a little bit of respect especially when commenting on a recipe that was provided to you for free. Also, if you look at the title of the recipe, it states 5 minutes hands on. Most educated people would understand that “hands on” means the time in which it takes to initially make something which doesn’t include bake time or pickling time in this case. I would strongly urge you to keep rude and uncalled comments to yourself or educate yourself before commenting. Respectfully, this is my go to recipe for pickling red onion that I use on so many things! Thank you so much for sharing! 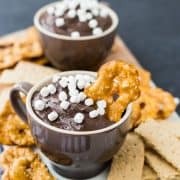 Do you think these would work with less or no sugar? They won’t taste exactly the same, but they should work. Good job on the Whole30! I’ve done two and I know they’re not easy! I can see these delicious onions added to home made cole slaw, and I’d like them with fried chicken, chicken salad and fried chicken–and on a hamburger, too. I may add a few allspice berries to the jar when I make it, to add a bit of spice flavor. I think a jar of these wonderful onions would make great christmas gifts! I love the idea of adding allspice! Yum! They would make a fun Christmas gift! Hi! I had pickled red onions for the first time last night at a Mexican restaurant and I was hooked immediately! I’m going to try your recipe but the ones I had were a little on the sweet side and I liked that. Can you taste the sweetness in your version or should I increase the sugar a little? Thanks! I haven’t tried these with additional sugar, but my guess is that it would achieve that taste you’re looking for! As the recipe is written, I wouldn’t say they taste sweet, and I’m fairly sensitive to sweet things. Let me know if you try it! Can I reuse the vinegar mixture for the next batch? I have never done that, it always appears a little cloudy by the time I’m done using the onions so I prefer to start fresh since vinegar is fairly inexpensive. Let me know if you try it, though! Made these this afternoon, anxious to try them on my Greek salad. I bet they were yummy on a Greek salad! I hope you loved them! Yes!! I love pickled onions! Can’t wait to do this!!! I can’t wait to make this recipe. Which one is better, Hot water or warm water? I love pickled onions so much. They add a tangy and almost sour taste that you can’t really get from many other condiments. 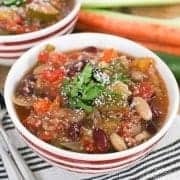 I love how quick and easy this recipe looks. Can’t wait to try it! Thank you for sharing.